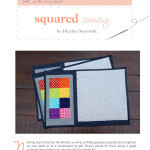 Round 2 of the Schnitzel & Boo Mini Quilt Swap finished up awhile ago, but I never shared my project until now. I was checking the draft section and realized this post never got published, so here’s to catching up! 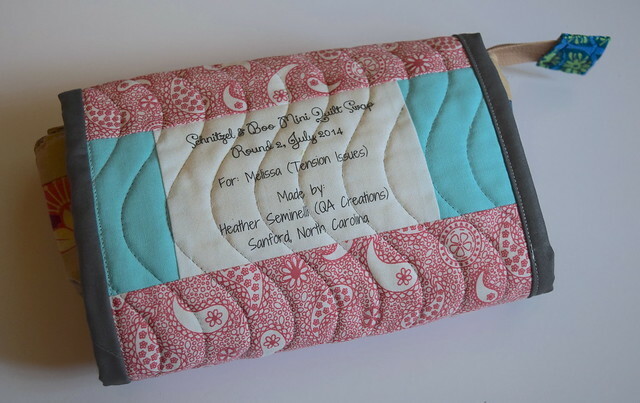 My partner likes bright rainbow colors and the simplicity of Alissa Haight Carlton, the colors of AMH and Allison Glass, and Tula Pink’s quilt designs. I hope this lives up to all of that! I was very inspired by “Every Color” by Alissa Haight Carlton. 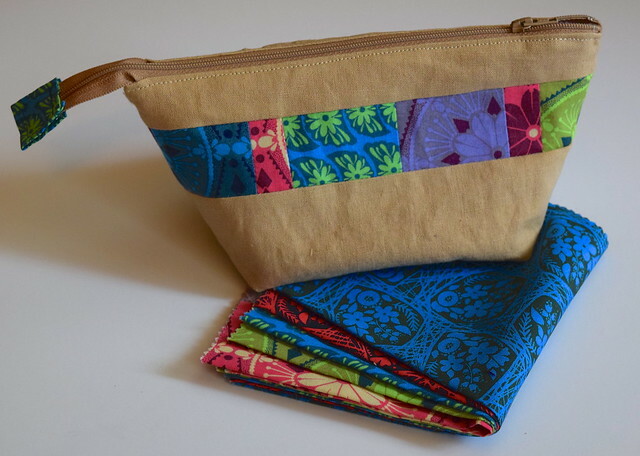 I also included a little pouch made from the Open Wide Zippered Pouch Tutorial by Noodlehead and some bits of True Colors by Anna Maria Horner. From my “stalking” I discovered my partner’s favorite colors are aqua and pink, so I included that on the back. I also tried printing on fabric for the first time for the label, and it was so easy! I used this tutorial for printing on fabric using an inkjet printer. I am not sure how this works for labels that need to be washed, but for a mini that will hang on a wall, I think this method works great! I hope you liked this partner! In return, I received this sweet heart mini with some treats from Pure Joy Creative. That aqua fabric was used up with a week or two, so never fear that it is sitting unloved in a stash somewhere! Thanks for the wonderful mini quilt swap! Linking to: Fabric Tuesday @ Quilt Story, Sew Cute Tuesday @ Blossom Heart Quilts, Let’s Bee Social Wednesday @ SewFreshQuilts, Needle and Thread Thursday @ My Quilt Infatuation, Whoop Whoop Fridays @ Confessions of a Quilt Addict, Fabric Frenzy Friday @ Ft. Worth Fabric, and Sewjo Saturday at My Go-Go Life. Such a cute mini! I really love how the dark grays really make the rainbow colors pop. Very cute label too. I’ve always wanted to use a printer to make nice looking labels but ours is a laser one. I don’t think I can convince my husband that I need another printer just for making quilt labels. 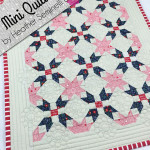 Love the bright colored mini quilt! 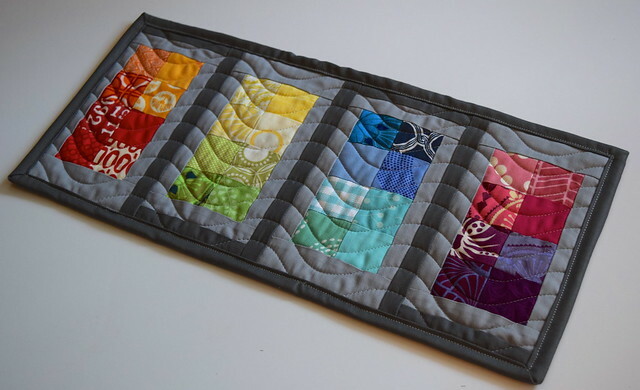 Trust me to get distracted by details instead of the lovely overall effect, but how did you quilt the wavy lines? Walking foot or FMQ? Marked or freehand? They (and other things) look great! I was wondering the same thing, just forgot to ask! 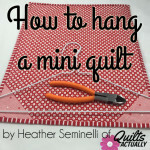 Love your mini and I’m sure your partner must have too! Oh, so wish I were the recipient of that mini — it’s sweet! 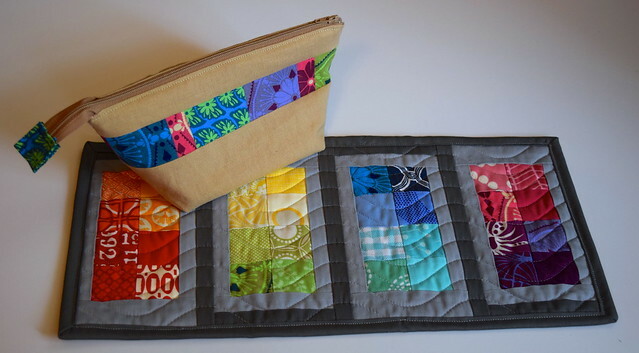 I love the two shades of gray around the colorful patchwork.